THE Chief Secretary to Government, Isaac Lupari, has recently assured members of the Diplomatic Community, who are also representatives of the 20 economies that infrastructure development for APEC 2018 has been budgeted for since 2013. The Chief Secretary said infrastructure development has been a part of government’s key priorities and therefore has been budgeted for by the Government. “This has been budgeted for every year since 2013 to support this preparation,” Mr Lupari said. “You will see in Port Moresby, the road network is absolutely fantastic. “We knew that we would have some issues trying to take leaders to their accommodation therefore the flyover was built to make it easier. “We are also collaborating with the private sector for accommodation and we are collaborating with the National Capital District Commission in making sure that Ela Beach is part of the development. 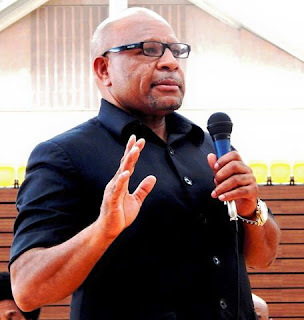 “Besides that we have invested in the training of Papua New Guineans and some of the successes that we have had are the hosting of meetings and games in the country. “We have had people involved since day one, in terms of protocol, in terms of logistical assistance, so since 2013, the government has been investing strategically in preparation for APEC 2018. The Chief Secretary said for 2017, the Government has budgeted K250 million for APEC 2018. He further added that where there is need for additional funding, of course the Government will find a way to source the funding needed. “The Government is fully committed to APEC 2018,” Mr Lupari said. The Chief Secretary said the development of the APEC Haus is a collaboration with Oil Search (PNG) Limited, who will be funding the project at the cost of almost K240 million. “Good thing is that we have started preparations three years ago. “The Government has invested in both these activities (APEC 2018 and 2017 Elections), and I am confident that we will deliver the 2017 National Elections and APEC 2018. “The key challenge for us is not so much economic issues; it is the ability of our Public Service to deliver. “The Public Service continuous to be the major obstacle to implementation and delivery of the government policies and programs. “It is important that every public servant in the country reflect on our performance in 2016 and start 2017 with a change in attitude and take greater ownership. The Chief Secretary said changes in attitude was evidence in 2016 and we must build on these improvements in 2017. “We owe it to our people and children,” the Chief Secretary said. “It is incumbent upon all public servants to work together as a team. “As team PNG we will deliver. It we continue to work in isolation, we will lose. The Chief Secretary urged all public servants to work together and build a better place for all of us. He said the Government has delivered on its part by putting in place the right policies and the funding; it is now the turn of the public service machinery to play its part in implementation. “Finally, I encourage leaders from the districts, provinces and at the national level to support the public service including public service reform programmes,” the Chief Secretary said. The Chief Secretary emphasized that our people’s livelihood and lives depend on us. He said it is time, the beginning of a new era for PNG and that it begins in 2017.